As an Author Coach, S.W. Cannon uses different platforms to reach out to and educate writers that wish to become Published Authors. 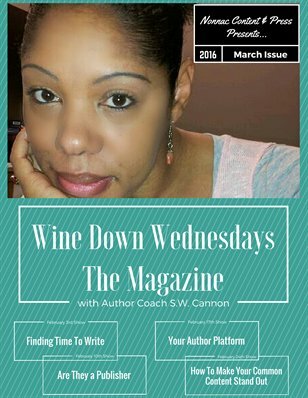 Wine Down Wednesdays is a conversation with writers on various topics of interest and importance to them on their writing and self-publishing journey. The conversation takes place on Blab, which can be accessed through the Blab app or the website Blab.im. Meet her there every week at 8pm EST. This magazine represents a compilation of the month's information.